Soon I will place the S88 description here. 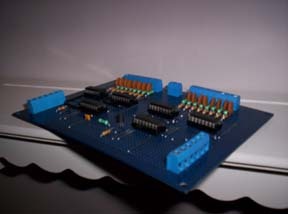 This is the interface which connects the S88 circuits with the parallel (lpt) port on the first computer. 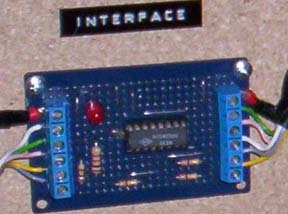 The serial (com1) port goes to the booster, on my layout a MRC with 8 amps of current. The S88 circuit. Almost the same as a Marklin S88, however much cheaper to make yourself. 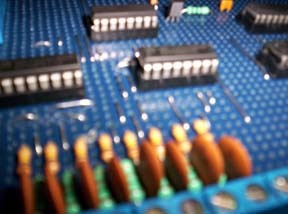 Here a small difference with the S88, a row of resistors and capacitors. This is to place all inputs on plus to prevent interference. When a ground signal is connected to the input it is detected as "on". 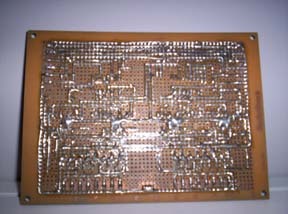 Here the circuit board from behind.